Welcome back to The Lisle Coffee Shop! You can sit anywhere. That's fine. 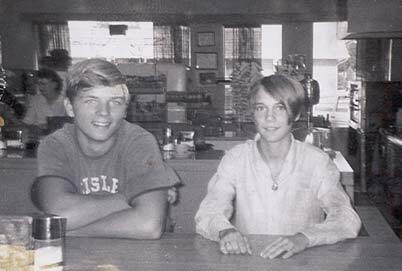 Would you just look at this PRICELESS photo of the original Lisle Coffee Shop. Ok... Let's see some hands... How many of you actually remember this place? Anyone? Anyone? Ok... I see some hands! The coffee pots in the foreground just says it all! 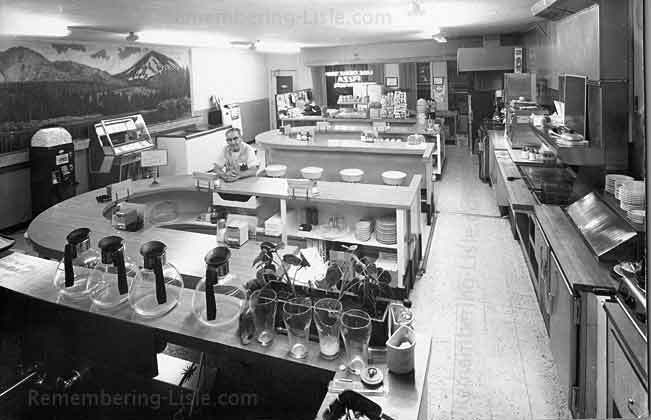 The Lisle Coffee Shop was located where the "Lisle Florist" is located today. Right on Main Street. It was one of the best "meeting places" Lisle has ever known. It only had one flavor of coffee and there was always an ash tray within reach. I spent hours talking to Sue Houha (The owner's daughter) and listening to her great stories about this place. Old Rosie (with her bags of stuff and squeaky metal pull shopping cart) was a frequent visitor. It was "the" place to go for coffee and to catch up on the latest. 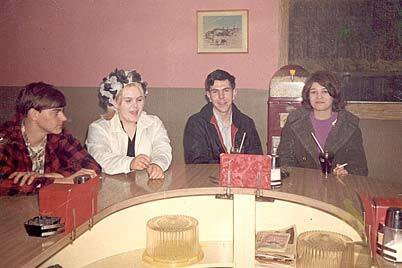 Many local Lisle girls waitressed there at one time or another. Sue even told me about the secret parties they would have after closing. Her parents didn't know but this place was sometimes jumping well into the night. Think about it. It was like a Denny's, Starbucks and an internet chat room all rolled up into a classic diner in the middle of downtown Lisle Illinois. Scroll down to see "close ups" of this photo and more. No.. They just don't make 'em like this anymore! 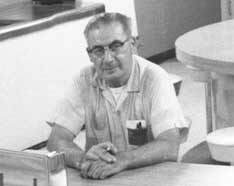 I love this close-up of Irvin Houha who, with his wife, were the original owners. I wonder if he knows that, after all these years, there are people still "enjoying'" his place. When I zoomed into these two items I screamed out loud "NO WAY!!!" 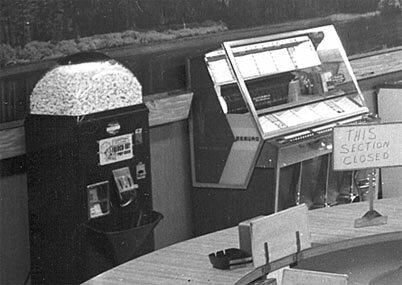 That popcorn machine made the place smell wonderful. Remember the little door on the left. That is were the popcorn bags were. My stupid friend would always grab like ten of them. Why? I don't know. how the records get put on to the little record player inside. Ok.. 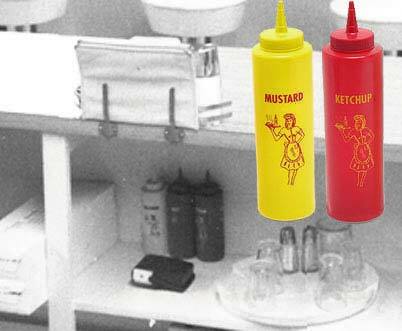 I just had to zoom in to this shot of the ketchup bottles that were stowed under the counter. I used to be able to squeeze out more than half the ketchup bottle onto my cheese burger. Now that's livin' baby!! I used to sit and "zone out" while my mom would sit and talk with her friend. It seemed like an eternity! Out of desperation, I would find things to look at... Like... The little lady on the ketchup bottle. 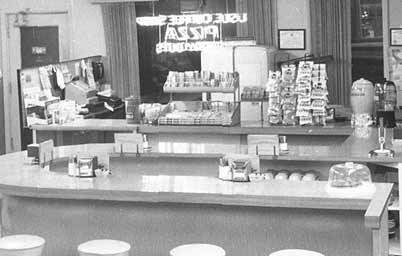 I wondered "how come there weren't any waitresses that looked like the "ketchup lady" working at this place???" Anyway... I found these ketchup bottle "reproductions" that look identical to the originals from the zoomed in picture. 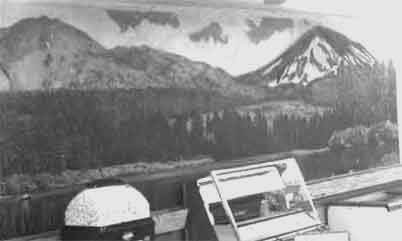 This mural was on the north wall. I used to think that it represented where the owners were from. Sue told me her dad just liked it. Here is a close up of the check out counter. Now look at the next photo below. This is a "close up" of the above close up. Do you see the red arrow by the candy display. Do you remember how the bottom front of the display (where the arrow is pointing) looked like stacks of Lifesavers candy? Yet they were only molded into the metal of the display.?? I used to try to pull them off when I was a kid. I'm not sure why I got such a kick out of that.. Oh well. Also, those are "Jay's" potato chips hanging in the center. That's a lemon aid dispenser on the right and an ice tea dispenser on the far right. 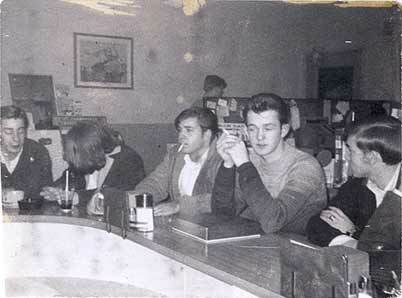 Now here are some Photos of some of the kids hangin' out at the coffee shop. Do you recognize any of them? 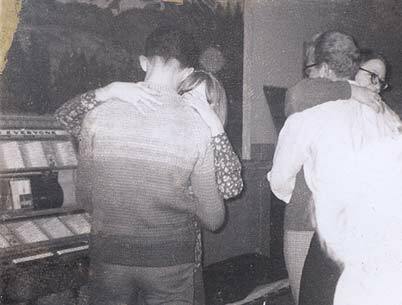 My favorite has got to be the photo of people dancing next to the juke box. I just wonder what tune was playing. Oh, that's Sue wearing that cool black and white hat on the left. 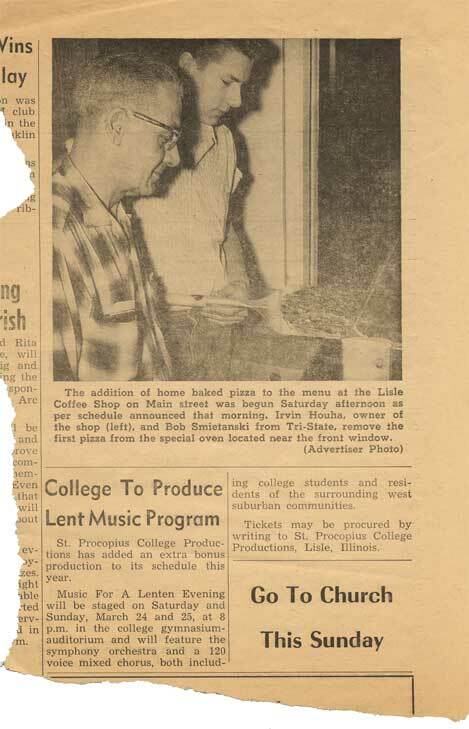 Here is a great "Lisle Sun" newspaper clipping announcing the arrival of The Lisle Coffee House's new pizza oven. Yes! This was big news! One other small note. Scroll down to the bottom of the newspaper clipping. There you'll see a simple statement (not paid for by anyone) that you would never see in a newspaper today. Kinda sad. HEY YOU! We welcome your comments, stories or pictures!